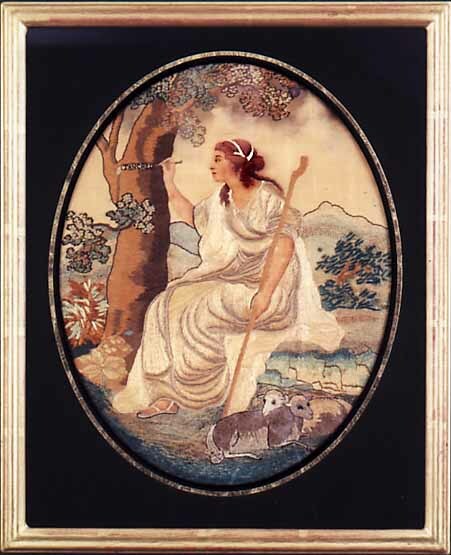 The subject is taken from the book 'Jerusalem Delivered' and depicts either Clarinda or Erminia inscribing his name on a tree trunk. Framed size: 32 cm (13 in) x 38 cm (15 in). 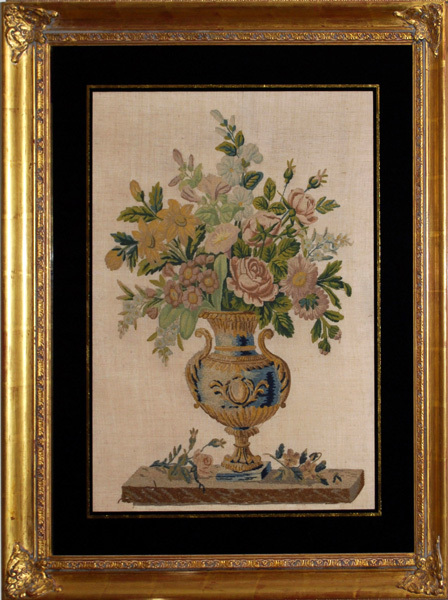 A finely worked embroidery depicting an urn filled with an attractive arrangement of flowers using silk and chenille threads on a fine linen ground. Damon and Phoebe. French Early 19th century. An outstanding silk embroidered pictue worked with coloured silks and metallic thread in meticulously shaded long and short stitch. 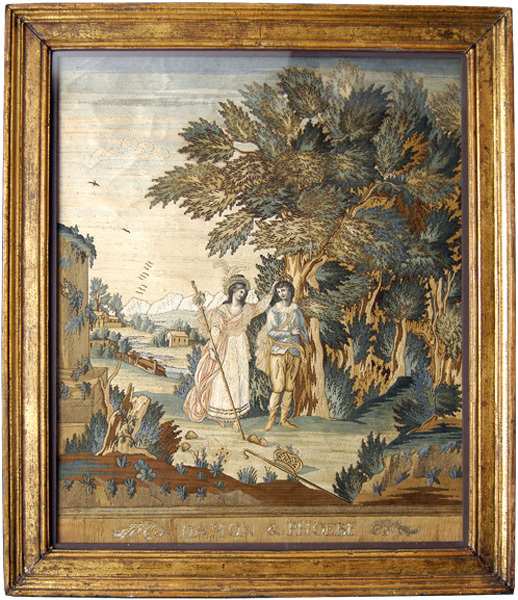 The fashionably dressed figures representative of a shepherd and shepherdess are set within a bucolic landscape. Port of New York. Circa 1850. 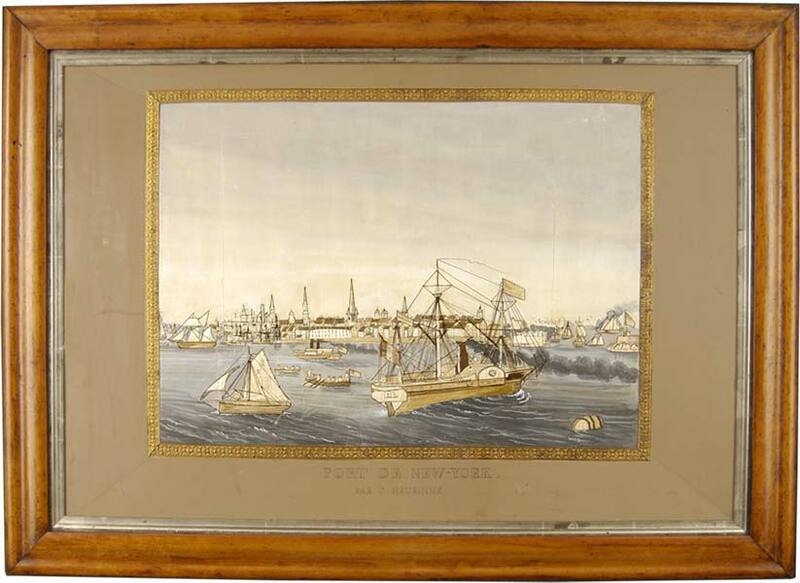 A very rare American silk embroidery with water colour painted details worked by J.Murinne. The scene is based on a marine painting by the artist, Louis Augier, circa 1850 who did a number of studies of New York and was popular at this period. Contained in a period maple maple frame with the original mount. Framed Size: 57.5 cm (23 in) x 78 cm (31 in).